I hope you can forgive me for posting these sweet, snowy treats so early. I’ve been excited to make them for quite some time, and if you’d like to make them too, you’ll have lots of time to plan! 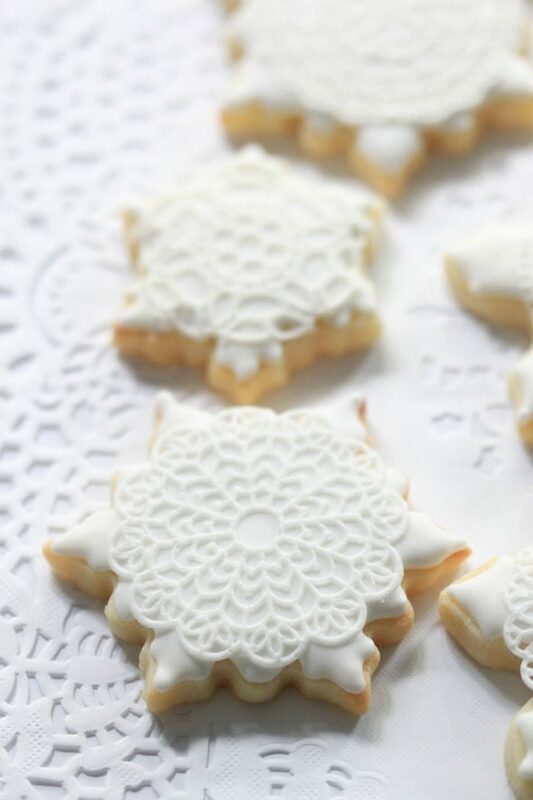 They’re simple enough to make, of course with some key tools, instructions and the special icing for the delicate, edible, sugar lace; SugarVeil. SugarVeil is a confectionery icing which is like any royal icing; it can be piped, or used to flood cookies etc., but the absolutely unique (and amazing!) thing about it, is that it’s actually flexible and pliable while it’s drying, so that it can be manipulated into shapes just like a fabric would, for example. I love how easy it is to take these cookies from basic to beautiful. I simply followed the directions on the SugarVeil packet and have created a video here for you. 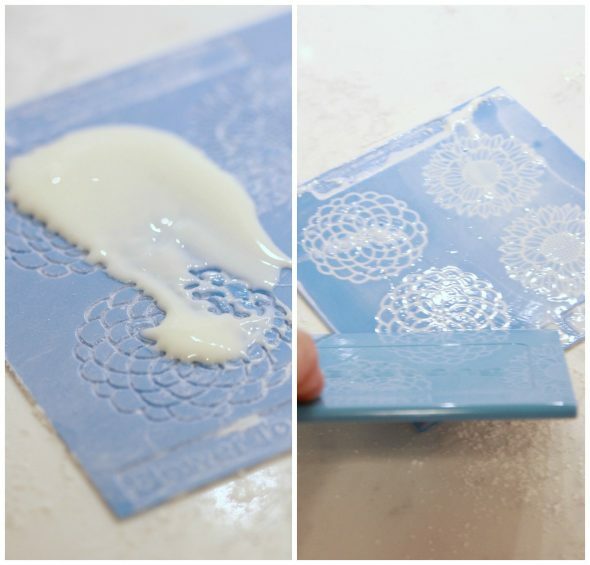 SugarVeil icing, tools and most mats are available at Michael’s in the United States and Canada. The mats and tools are also available online at Michaels.com. It tastes delicious and a few good things to know is that it’s gluten-free, kosher and contains no artificial flavours or preservatives. If you’d like to make these or other creations with SugarVeil, I’ve also outlined a step by step guide below. *Some items below include Amazon affiliate links. 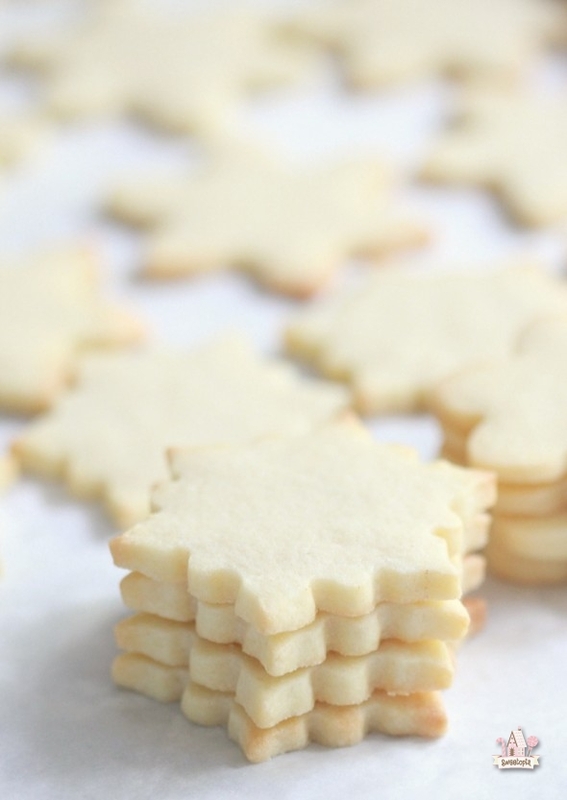 Make and bake the sugar cookies. 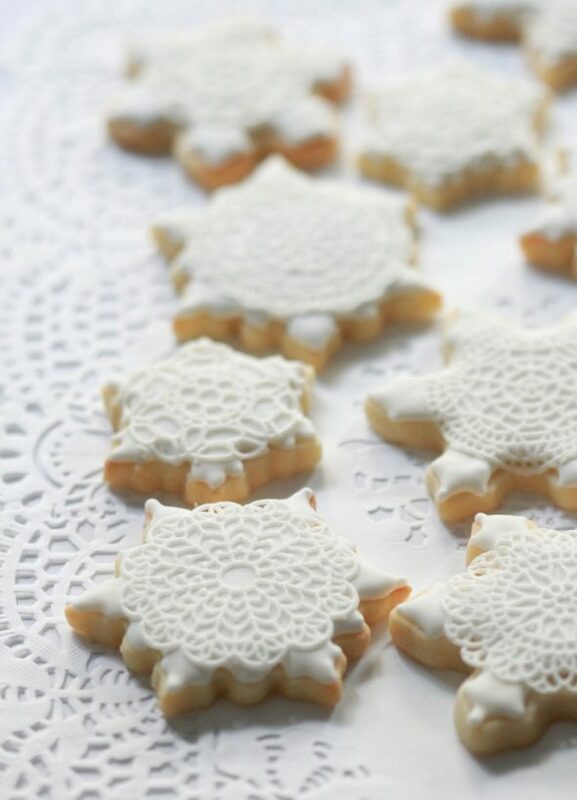 You can find other cut-out cookie recipes here. (Click on the items in the blue box on the left to find them on-line and also see the mats below). Step Two: Make the SugarVeil icing according to the package instructions. You will need a mixer of some sort, even if it’s a $10.00 hand blender. Besides the SugarVeil powder, the only other ingredient is water. Step Three: Make the royal icing and flood the cookies. 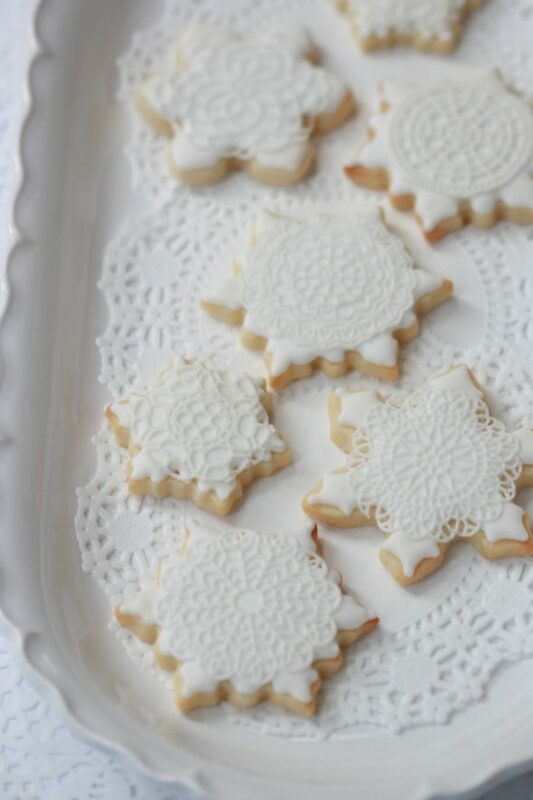 See here for videos on how I flood my cookies with royal icing. You can find lots of how-to’s in the the tutorial section above as well. 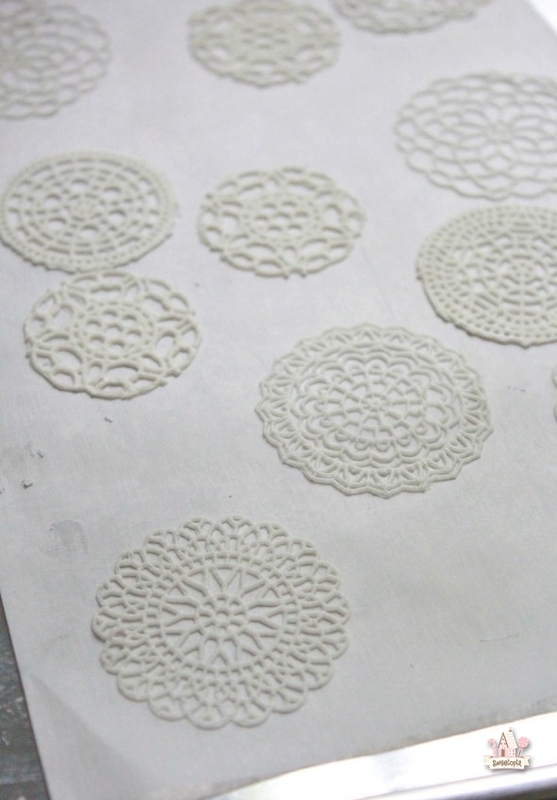 Step Four: While your cookies are drying, start working on the edible lace. a) Dust some cornstarch onto the mat, press the cornstarch into the groves with a clean towel and shake the excess off. Alternatively, you could spray a very light coating of vegetable spray (but not both cornstarch and vegetable spray). Put a dollop of SugarVeil on the mat. If you have too much or too little you’ll be able to figure that out in the next steps. b) Using the spreading tool, spread the SugarVeil out on the mat. You can move in any direction, as long as you distribute the SugarVeil over the whole mat. It helps to press down while you’re spreading too, that way the icing is forced into every little groove. c) Once you’ve spread your SugarVeil across the whole mat, clean the edge of the spreader with a damp cloth, and do one last clean swipe of the whole mat. This will clean up all the edges. d) SugarVeil may be set in a 200 F / 93 C degree oven or air dried. See individual mats for set times. SugarVeil is set when it is firm, separates easily from the mat and does not stretch out of shape. If SugarVeil still feels sticky after recommended time, place back in oven for one minute. Remove from oven. While on baking sheet, gently wipe entire mat with damp cloth in a circular motion and let set 10 minutes. Once the SugarVeil has set, you’ll be able to easily peel the corners of the SugarVeil away from the mat. 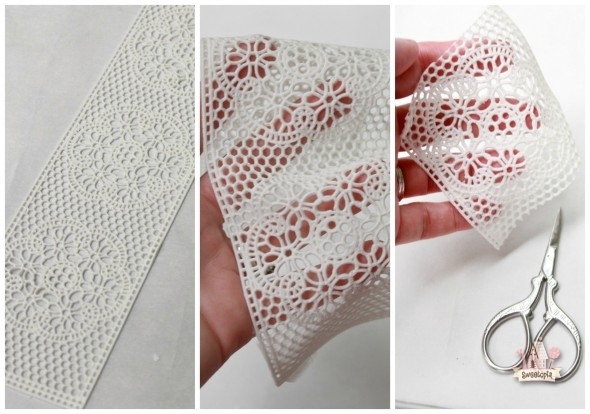 Place the mat face down and use your fingers to start peeling away the lace from the mat, and then use your spreading tool or fingers to pin the lace down while you peel the mat away from the lace. Peel away approximately 3 inches or 8 cm at a time, reposition the spreader close to the mat again, and peel away. The key idea is to peel the mat away from the lace, and not the lace away from the mat. 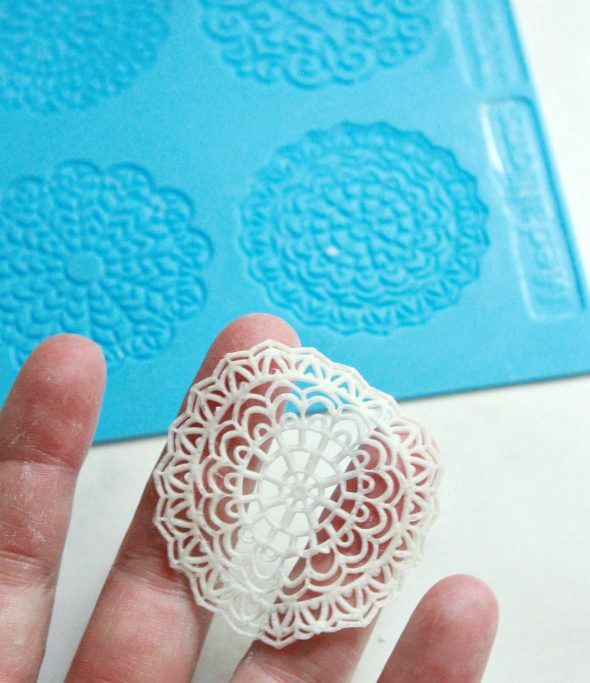 Once you’ve peeled the mat away, you’re left with your edible lace! You may be able to tell from the photos – the lace is pliable, and although it’s delicate, still fairly easy to work with. 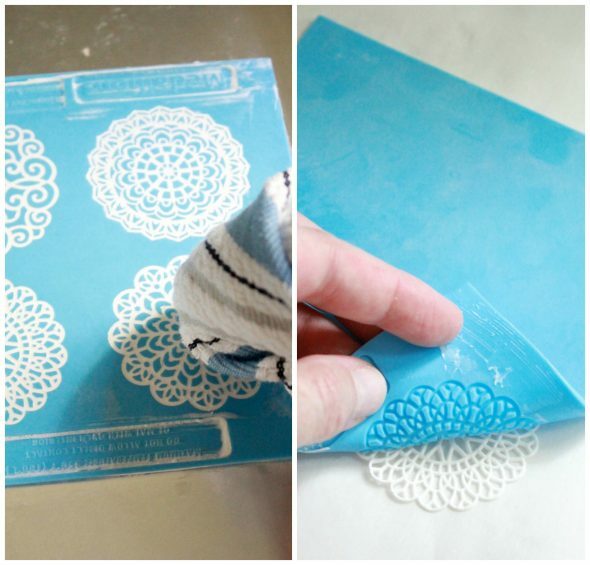 If the lace gets a bit sticky, put some cornstarch on your fingers while working with it. Step Five: Besides manipulating it into ribbons or any number of shapes, you can cut out the pieces you need to suit your design. 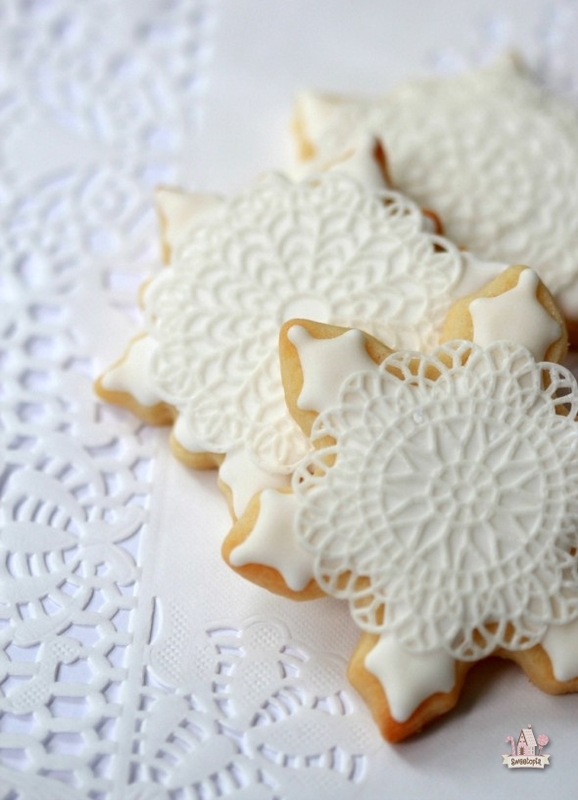 Step Six: Place your edible lace onto the cookie and gently press onto the surface of the dry royal icing. (Make sure your royal icing has dried for at least a few hours. 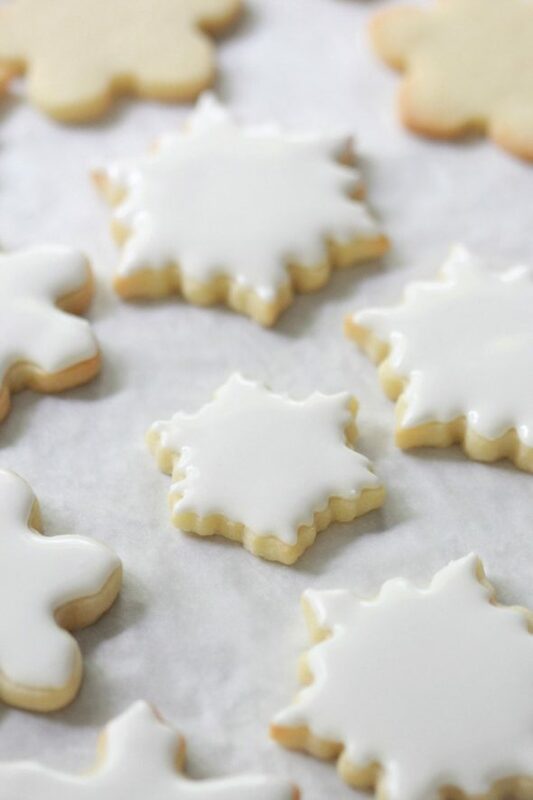 Drying time depends on humidity, but you should be able to press on the surface of the royal icing, without indentations happening). 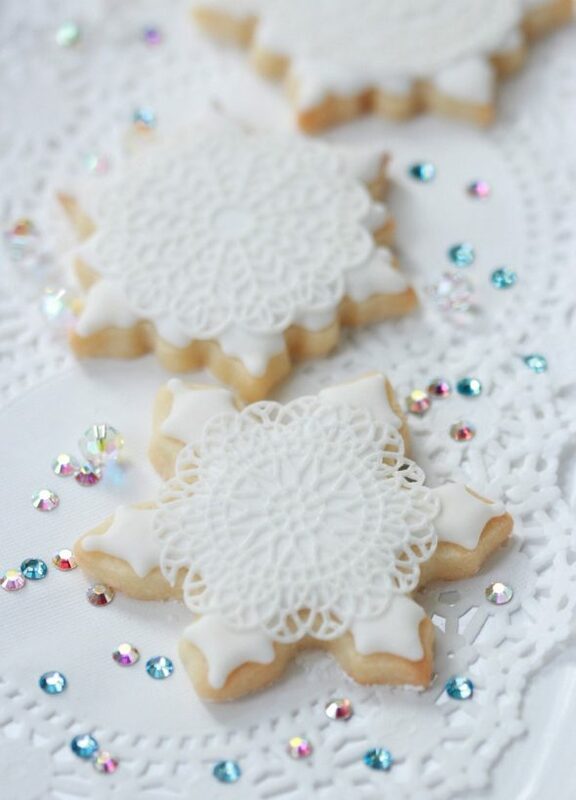 The SugarVeil lace easily adheres to the surface of the iced cookie. I hope this tutorial has helped you! I welcome any questions or feedback. Please feel free to drop me a line below in the comment section or on social media. You can find me on Facebook, Google+, Instagram, Pinterest, Twitter and YouTube. Oh, they are just beautiful and what a marvellous product. It is November, and Christmas is everywhere, I’m already making lists of things I want to bake. Thanks for the video. What did you brush on the sugarveil before placing it on the cookie? I brushed a tiny bit of water to help it stick to the icing. Adorable!!! Excellent video! Makes me feel like I should be able to do it too! Thank you for teaching us all your talents. You are soooo patient! What lovely cookie and for me a very timely one too. 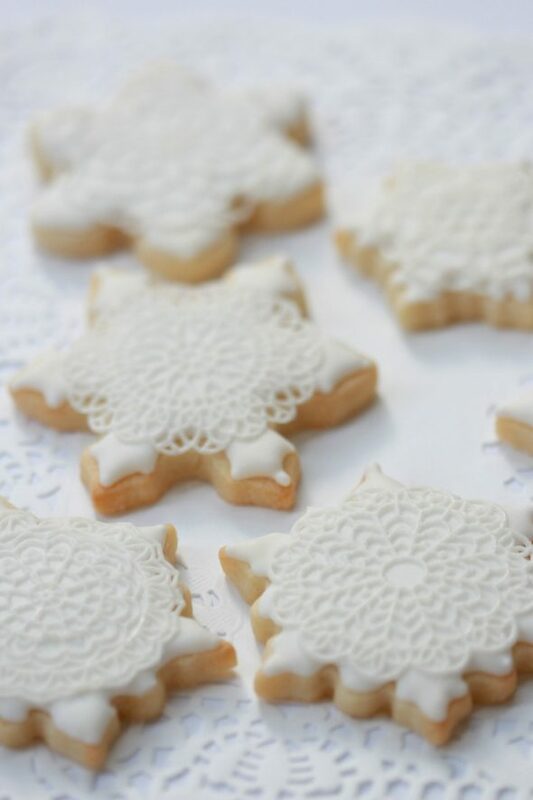 I am baking five dozen cookies for my young cousin’s bridal shower and was about to search for the video from several years ago where you made cookies topped with fondant snowflakes. Wow, I love this design! Simple yet stunning! Thank you for it :). I just saw this video and post. Can the SugarVeil lace rounds be made ahead of time so I have a good stack of them to place on cookies when I’m ready to decorate? Or will they totally dry out and become brittle? I only have one mat with spaces for 4 little “rounds”.